I was honored when my friend and colleague, Karl Kapp, asked me to contribute to his new book, The Gamification of Learning and Instruction, which launched this week. As I sit down to write this foreword, I reflect on how many games I encountered in the previous week. I saw my youngest daughter playing Club Penguin on the Internet, my son playing Mario Super Slugger on the Wii, my oldest daughter playing Zoo Tycoon on a laptop, my sister-in-law tending her Farmville crops on Facebook, a friend playing Angry Birds on her iPhone, a Cancun cab driver explaining how he plays Call of Duty with others from around the globe, and the US Naval War College describing to me their war game to assess their ability to deal with new conflicts that might arise from the climate crisis. All of this just in the last seven days! And I hesitated to actually list all those games by name, knowing that it will instantly date this book, just as the games I grew up with—Pong, Space Invaders, Zork—instantly date me. Yes, from casual games to serious games, from smart phones to consoles, from toddlers to retirees, games are everywhere. Although games themselves are of course not new—they’ve been played in the earliest civilizations—we have reached a confluence of technology and design where games have become ubiquitous, and seem to have a unique ability to engage when we most need it. It is this power of modern, digital games to engage that have caused “gamification” to become somewhat in vogue. Just as many industries benefited from the principles of industrial design, and interface design, and experience design…smart industries and businesses will quickly learn and adapt the principles of game design (or game “mechanics”). 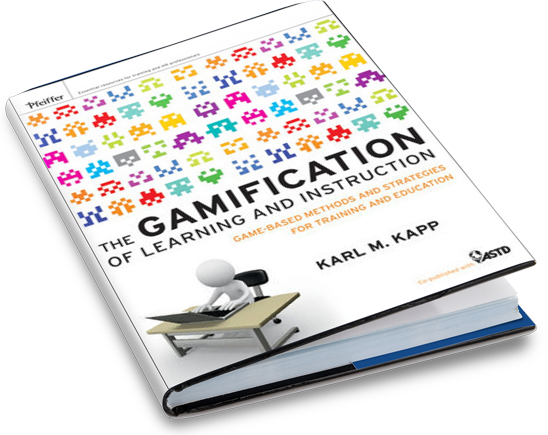 Karl Kapp has written the definitive guide to gamification which itself is accessible and engaging. He brings trends to life and illustrates the principles of gamification through numerous examples from real-world games. Whether he’s describing the Cisco “Binary Game”, the US Navy’s multi-player anti-piracy game, or even the importance of aesthetics in a simple chess piece, Karl captivates the reader and ensures comprehension page after page. There is no doubt that “gamification” is an important and powerful weapon in the arsenal for employee engagement, sales and marketing, learning and behavior change of any kind. This book is a valuable guide for all who are trying to understand or adopt these important design principles. Check out the Gamification Facebook page.